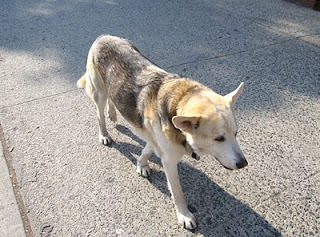 But he was carrying a raw steak, chomped firmly between its jaws – not eating it, just carrying it … head down, focused, following his owner leashless down the sidewalk! I didn’t get a pic of the T-bone. Now I know leashless walking is strictly illegal, and I shouldn’t condone it. But when a dog is very well-behaved, obedient, and psychologically balanced, it is often far less problematic than so many leashed dogs who are so often lunging, barking, psychologically and emotionally unbalanced, untrained, disobedient, and pent-up! But this post isn’t about leash-walking. It’s about dogs carrying stuff – and how that can help keep them under control. 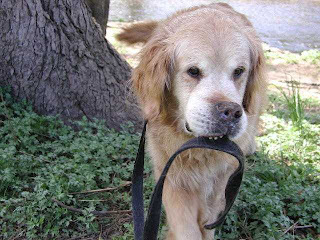 Our old dog Freedom used to carry bagels (yes only bagels!) home, for blocks and blocks, then run out into the yard as soon as she was home to bury them. The activity served no purpose at all, except for being incredibly endearing. However, in most of her life she was a bit of a nervous Nelly, except as soon as she’d get that bagel in her jaws, she’d march in a straight line back home never flinching or being distracted by anything. It was amazing! Now I’m not sure what the Brooklyn Heights dog-owner’s idea was with her dog carrying the steak, but if it was meant to give the dog a job that focused him and kept him obedient and out of trouble, than kudos. 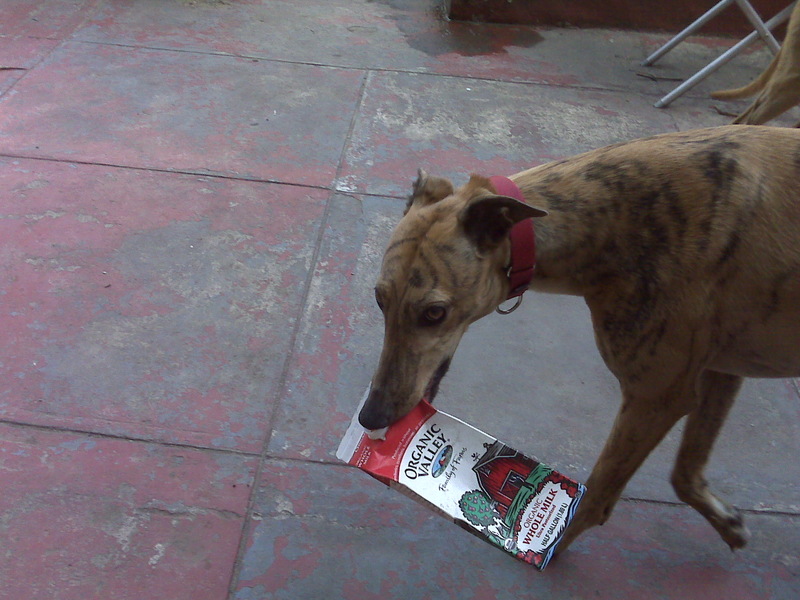 Retired racing greyhounds are notorious for heightened prey-drive, which can be very dangerous if left untrained around other dogs, not to mention around smaller animals like cats. At my local dog park in Boston, there was one greyhound whose owner managed the problem by having her grey carry a Kong whenever surrounded by other dogs or other triggers. It worked like a charm! If aggression or prey-drive levels mounted, she’d command her grey to “Take” the Kong; he’d chomp onto it with glee. It was his job! And though he’d continue growling and prancing around, he could never bite because his mouth was occupied. Though not quite as complete as training not to bite, the “take the Kong” technique was so much kinder, more creative, and more therapeutic than simply restraining him, leashing him up, or even adding a muzzle. He was self-contained, self-restrained; and the management technique kept him from ever doing something unacceptable and suffering the consequences (which would have been immediate and permanent exile from the dog park, or worse). A muzzle, on the other hand, doesn’t keep a dog from aggressing; it just keeps them from biting when they do aggress. And the other dogs don’t notice the muzzle either; so even though your muzzled dog can’t bite, he can sure get bit back when he tries and fails. We’ve all seen dogs (usually labs, right?) carrying their own leashes – which sort of looks like they’re taking themselves for a walk. Great technique! The dog has a job, and the leash is ready for the taking if you need it. And if anyone can help me get a pic of that Brooklyn Heights steak-loving pup actually carrying the steak – dinner on me!